[S190] Index - GRO and Office of National Statistics, England & Wales Civil Registration Qtrly Indexes, Birth: District of Lambeth, Vol 1d, p493, 4Q1885, mother's maiden name FORSEITH. [S178] Census - 5 Apr 1891, UK census, ED 23 RG12-406 Folio 43 p26. [S430] Census - 31 Mar 1901, UK census, ED 1 RG13-461 Folio 18 p28. [S677] Index - England High Court of Justice, England & Wales National Probate Calendar, probate granted at London to Gladys Forsaith Evans and Hilda Maude Evans, spinsters. [S677] Index - England High Court of Justice, England & Wales National Probate Calendar, probate granted at London to Florence May Greir HIGHAM, widow, and Reginald MOORE, solicitor. [S190] Index - GRO and Office of National Statistics, England & Wales Civil Registration Qtrly Indexes, Death: District of Lewisham, Vol 5d, p323, aged 80. Gwendoline V EVANS was born in 1930 in Chatswood, Sydney, New South Wales. [S190] Index - GRO and Office of National Statistics, England & Wales Civil Registration Qtrly Indexes, Birth: District of Lambeth, Vol 1d, p439, 3Q1888, mother's maiden name FORSAITH. [S1044] Census - 29 Sep 1939, UK Register, RG101/0571A/014/29, Letter Code: AXAA, Schedule 221. [S687] Census - 2 Apr 1911, UK census, RG14PN2252 RG78PN77 RD26 SD4 ED2 SN24. [S677] Index - England High Court of Justice, England & Wales National Probate Calendar, probate granted at London to Gladys Forsaith LANGSFORD, widow, and Edith Mary HEAD, spinster. [S190] Index - GRO and Office of National Statistics, England & Wales Civil Registration Qtrly Indexes, Death: District of Lewisham, Vol 5d, p62, aged 71. [S928] BDM NSW Registry, marriage record, Reg. No. 14534/1943. [S946] Shoalhaven Cemetery databases, at http://shoalhaven.public-cemeteries.net/, Cambewarra General Cemetery, Independent portion, row 1, number 20. [S927] BDM NSW Registry, death record, Reg. No. 12269/1922. [S493] Macquarie Park Cemetery database, at http://www.maccem.com.au, Church of England, section D2, position 16. [S190] Index - GRO and Office of National Statistics, England & Wales Civil Registration Qtrly Indexes, Birth: District of Bristol, Vol 6a, p201, 3Q1901, mother's maiden name NEWMARCH. [S1044] Census - 29 Sep 1939, UK Register, RG101/0138B/016/27, Letter Code: AGAB, Schedule 281. [S1058] Newspaper - Newspaper - multiple, Nottingham Evening Post 26 Jun 1913, The Era, London 10 Aug 1921, Portsmouth Evening News 20 Mar 1922, Edinburgh Evening News 2 Feb 1924, The Scotsman 4 Jan 1927, The Era, London 10 Dec 1930, The Scotsman 28 Mar 1932, The Era, London 5 Dec 1934, etc. [S190] Index - GRO and Office of National Statistics, England & Wales Civil Registration Qtrly Indexes, Death: District of Maidstone, Vol 16, p1336, 2Q1977. [S917] GRO Scotland, marriage record, District of Possilpark, Statutory Marriages, GRO 646/07 0110. [S918] GRO Scotland, death record, District of Kelvin, Statutory Deaths, GRO 644/07 0440, aged 85. [S502] Index - Victoria BDMs online, at https://online.justice.vic.gov.au/bdm/indexsearch.doj, Birth Reg. No. 1895/10750, son of Geo FALLA and Clara Victoria COLLINS. [S415] CD - Sth Australian Marriages, Sth Aust Index of Marriages 1917-1937, Book 307, p893. [S190] Index - GRO and Office of National Statistics, England & Wales Civil Registration Qtrly Indexes, Marriage: District of Birmingham, Vol 6d, p326, 1Q1917; his name recorded as Mac Claude. [S502] Index - Victoria BDMs online, at https://online.justice.vic.gov.au/bdm/indexsearch.doj, Death Reg. No. 17811/1957, aged 58. [S682] Geelong Cemetery Trust cemetery database, at http://www.gct.net.au, Regiater #1633, location MET*2***300. [S502] Index - Victoria BDMs online, at https://online.justice.vic.gov.au/bdm/indexsearch.doj, Death Reg. No. 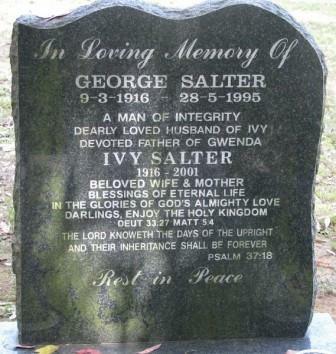 12127/1975, aged 76, son of George FALLA and Clara Victoria COLLINS under the name of Stanley Claude. [S682] Geelong Cemetery Trust cemetery database, at http://www.gct.net.au, Regiater #2372, location MET*2***300. [S488] Index - Queensland BDMs (online and fiche), at https://www.qld.gov.au/law/…, Birth Reg. No. 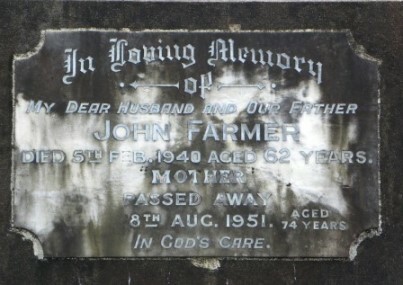 1877/B22107 to John FARMER and Elizabeth MCDONALD. [S183] National Archives Film - Queensland BDM Indexes, Microfilm, Reg. No. 1877/B022107. [S542] Index - New Zealand BDMs online, at http://www.bdmhistoricalrecords.dia.govt.nz/, Birth Reg. No. 1898/15829, daughter of James FARQUHARSON and Isabella. [S542] Index - New Zealand BDMs online, at http://www.bdmhistoricalrecords.dia.govt.nz/, Death Reg. No. 1990/36259 gives this birthdate. [S542] Index - New Zealand BDMs online, at http://www.bdmhistoricalrecords.dia.govt.nz/, Marriage Reg. No. 1923/7508. [S800] National Archives - NZ Archives (Archway), Probate, Nelson Court, record 4324, agency AAOO, series 17072, container C288887, box 128, image 341-352, digital folder 4735977. [S542] Index - New Zealand BDMs online, at http://www.bdmhistoricalrecords.dia.govt.nz/, Death Reg. No. 1948/25413, aged 58. [S970] Nelson City Council cemetery database, at http://nelson.govt.nz/services/facilities/cemeteries/…, Rec. No O_0070, cremation, ashes returned to Funeral Director. [S542] Index - New Zealand BDMs online, at http://www.bdmhistoricalrecords.dia.govt.nz/, Death Reg. No. 1990/36259. [S971] Tasman Council cemetery database, at https://www.tasman.govt.nz/my-community/cemeteries/, Richmond Cemetery, Black Roses, plot 21. [S970] Nelson City Council cemetery database, at http://nelson.govt.nz/services/facilities/cemeteries/…, Rec. No 3705, cremation.